Rapper Tekashi69, born Daniel Hernandez, is in custody after facing federal racketeering and firearm charges. The Brooklyn native was denied bail on Monday and is awaiting a second bail hearing on Tuesday, Nov. 20. Brooklyn rapper Tekashi 6ix9ine pleaded not guilty Monday to federal racketeering and firearms charges he faces. The rapper, whose legal name is Daniel Hernandez, is among five people indicted on charges that he directed or participated in violent acts as part of a deadly gang known as the 9 Trey Bloods. The indictment alleges that the violent episodes involving 6ix9ine included the July shooting of a bystander in Brooklyn and the gunpoint robbery of one of the gang's rivals last spring. No bail applications were made Monday. However, the judge will accept letters from counsel on bail and other motions. A pretrial conference is set for Jan. 22, 2019 with a trial date of Sept. 4, 2019. On Nov. 21, defense attorney Lance Lazzaro said in a statement that his client was "completely innocent of all charges." "An entertainer who portrays a 'gangster image' to promote his music does not make him a member of an enterprise," Lazzaro said. "Mr. Hernandez became a victim of this enterprise and later took steps by firing employees and publicly denounced this enterprise through a morning show. Threats were then made against his life which resulted in this case being brought immediately," he added. Assistant U.S. Attorney Michael Longyear said the rapper did not renounce his membership in the gang on the radio show a couple of weeks ago. 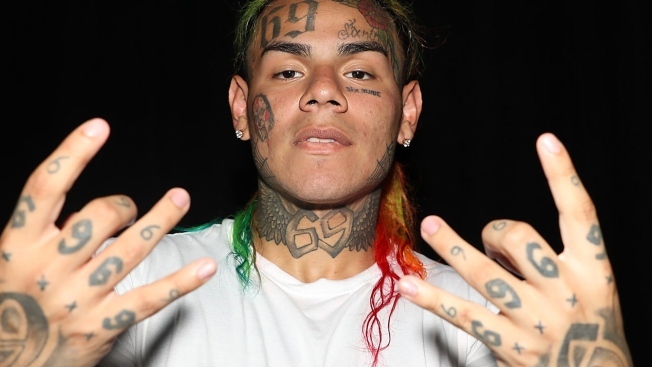 He said 6ix9ine would have been arrested last week anyway, but the timetable sped up when authorities learned that he planned to go to a Connecticut casino where it would be harder to protect him from the threats. Longyear said the threats were overheard on phone calls intercepted by investigators, including one in which an individual was heard saying that gang members wanted to "super violate him." The prosecutor noted that violence seemed to surround the entertainer. He said 10 shots were fired into a Beverly Hills, California, home where he was filming a music video weeks ago.